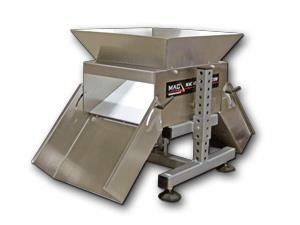 MAC currently offers four standardized types of part/runner separation systems. Part diverters are used to change the direction of a shot of parts, the discharge of a complete cycle or cycles of parts from an injection molding machine. 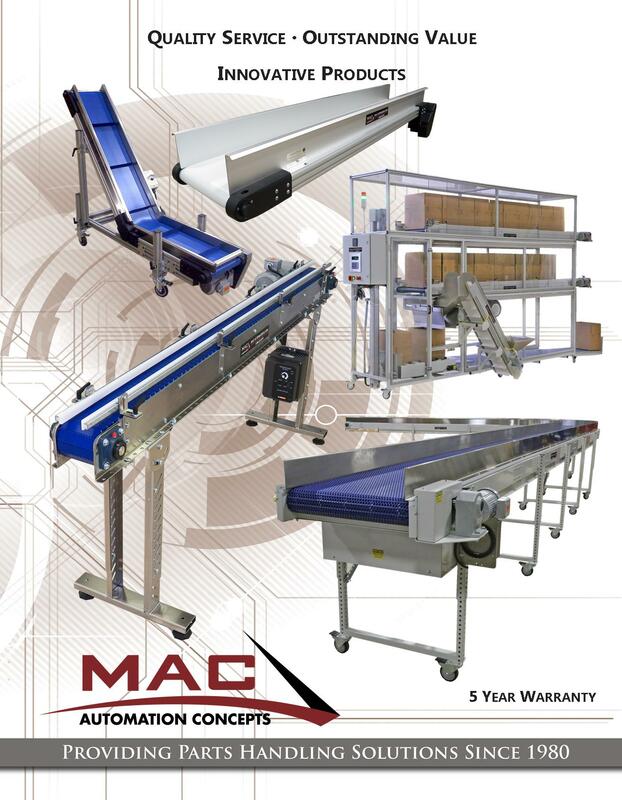 MAC Automation Concepts, Inc. currently offers two different styles of part diverters, also known as "part discriminators" in the injection molding industry. 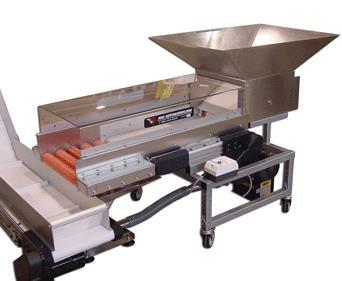 Designed to work in tandem with MAC series conveyors. 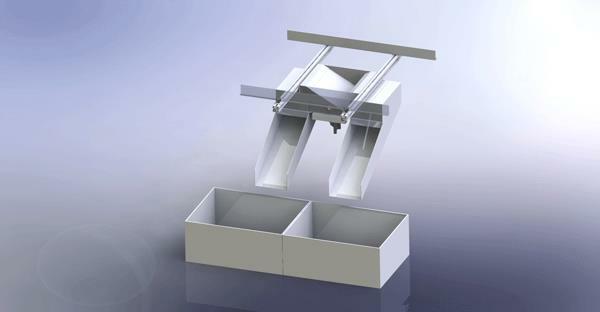 Units are designed to accept the overall width of the SF series, this design allows the frame to get tremendously close to the separator for tight tolerances. The following are the lengths and widths offered. 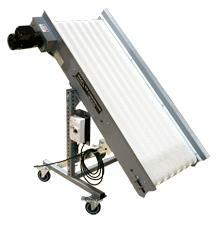 Included is a T-type steel telescoping stand, standard AC fixed speed parallel shaft gear-motor. Unit has adjustable angle from 0- negative 45 degrees. Your choice of pin heights 1-1/8" tall and 2" tall. Belt material is White Polyurethane with stainless staple lace, holes are punched on 1" centers on a staggered pattern. Pins have a shoulder to hold place in the belt, but the pins easily removed to be repositioned for different patterns. A textured, white polyurethane belt with chevron pattern and an endless splice is available for applicable runners and parts. A screw type separator is used to separate small parts form sub-runners, ideally suited for small to medium number of cavities and runners. A gap separation method is used between the screw and the adjustable angle slide plate. The smaller (shorter of the two pieces) fall through the gap. Roller separators consits of slave rollers driven from the under-the-press conveyor. Slave rollers are chain driven and are designed for independent gap adjustment. 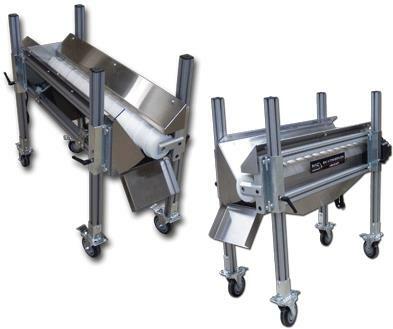 Rollers are mounted in a formed steel frame, mounted on a "T-base" support stand, support stand has adjustment from 18-30″ top of roller. The gear-motor is a fixed speed direct drive unit, 110/60/1 with power cord, manual motor starter and grounded plug.